I planted 2 different squashes in a planter and now the plants are getting big and I am wondering what I should do when they sprout and produce. Will they grow down to the ground or will I need to stake? They are yellow squash and patty pan. This is a first for me. 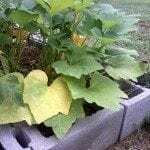 I have put them in a fairly shallow planter about 4 feet above ground and concerned that the stems will become to heavy to hold the squash to grow full term.